We’ve all heard of SEO, or search engine optimisation, and now Google is giving business owners the best way to control it. By listing your business with Google (the only search engine anyone really cares about! ), your company will show up exactly as you want it to – with your logo, street address, business type and more – before any other competing listings or ads. Better still, you can control your appearance in Google Maps and make sure your company shows up at your exact location. Open on public holidays or closed on Saturdays? Editing your business details allows important information like this to show to people searching your company. Not only will this keep your customers informed and optimise their experience of your brand, but you can save yourself valuable time answering frequently asked questions like – are you open on Heritage Day? Another great way to optimise your Google listing is to add photos, posts and products. Photos could be of your products, your staff, your office interior or shopfront. If you’re a restaurant how about adding food photography and a copy of your menu? When it comes to Posts, this is where you can get more creative with copy. Craft your brand story, add an event or promotion, or share some information about your business that’s best conceptualised in words. Products allow you to add prices and descriptions. 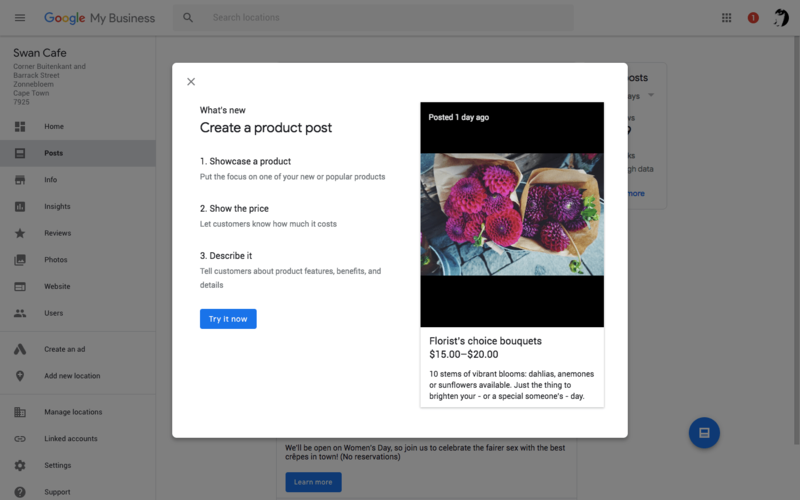 Now you can use Google’s intricate understanding of how people browse the web as Insights to better understand your customers. How did people find you? Where did they come from? What were they searching for? Which photos did they view the most? These are all useful pieces of information that you can use to optimise how you do business. 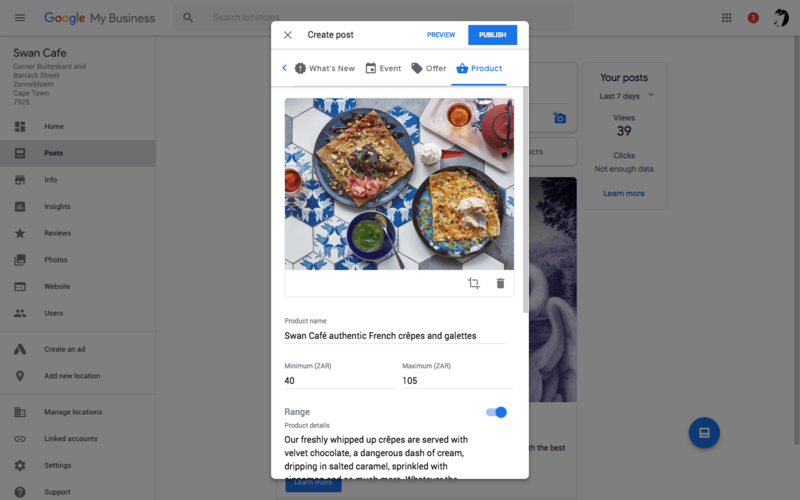 Customers are increasingly using Google to rate businesses and write reviews – and with Google My Business you’ll get an email the instant someone does, allowing you to respond. You can now build loyalty with your customers by turning their reviews into a conversation. Reward positive feedback and constructively act on criticism in real time, turning a visitor into a repeat customer. One of the first steps in achieving an optimised listing on Google My Business is getting it verified. This can be a lengthy process on your own, but we have partners here to help. Panoman in Cape Town is a trusted Google Partner who makes the process so much easier. They also offer immersive 360-degree photography which will allow customers to virtually explore your store right from Google Maps and Streetview. 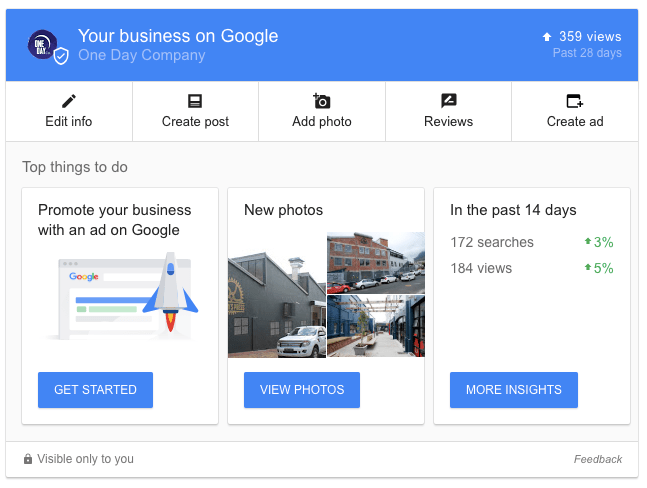 And finally, can I still use Google My Business if I don’t have a storefront? Absolutely. Whether you’re a home-based business or a service-area business, you can list your details to appear on Google with or without an address. A great starting point is simple: Google your business name and see what comes up. If you’d like it to appear more professional then Google My Business is for you.